On Sundays the whole neighborhood sleeps late. There must have been rain at dawn, for now the streets and the trees have taken on the darker hue and shimmer that the water leaves on their surfaces as it evaporates back into the sky. All the colors are rich and saturated, the peeling bark of the sycamore, the green weeds, the mangled red tricycle that sits on the curb awaiting the trashmen’s visit. I spool a roll of film into one of my old plastic toy cameras. It’s light and imprecise. My cameras are a good excuse to see the neighborhood, to stop and stare. The camera opens a space for that, and people always ask what I’m doing. They are puzzled, generally, by the antiquated equipment and the things they see me shooting: the buildings and the places where the buildings used to be. The surface of the canal, lambent with marbled oil. The trees and weeds overtaking the things man has left in his wake. Take him out and run him. Like a dog or a horse. I just nod. Then I have an idea. I set the camera down on the flat edge of a bench and point it at the jungle gym, the speeding boy. I hold the shutter open for a long time, maybe a minute. The picture will be washed out with light, the physical structures barely visible. And the boy will be a blurred streak of motion, pure energy and light. I try it a few times, varying the time the shutter is open. No problem, I tell her. I load another roll of film and keep shooting the boy’s flashing speed. When she comes back, he’s hanging upside-down from the monkey bars, resting. She hollers him over, in the commanding tone of mothers and generals. It works. He drops down and trots to her side. She waves at me. “Thanks,” she says and turns quickly back into the tall housing project building she lives in. I wait a while, watching, hoping for a rustle at a window that will show me which apartment is hers. But nothing happens. Eventually I move on. I loop through the neighborhood, down by the canal and back. When I get home, my lover Jimmy is sitting on the stoop. He doesn’t like phones, he is undaunted by waiting. “I was in the neighborhood,” is what he says every time I find him like this. It’s a joke that’s always funny. He lives four blocks away. He slides a hand around my calf as I climb the steps, and stands up to follow me into the house. I turn on the ceiling fans and a breeze picks up through the apartment, from the kitchen’s wide back windows out to the narrower ones overlooking the street. In my living room, a mosaic of photographs covers one long wall. I add a few new ones every week or so, and I shuffle them around, reworking the schemes, seeing which rules make better compositions. Jimmy stands in front of the wall now, giving it his fullest scrutiny. “I think it’s too much,” I say. “Never any people,” Jimmy says. It’s not the first time he’s observed this, and he’s pleased with himself. I chose Jimmy because I thought he was someone else. A nice guy who plays guitar and doesn’t think too hard about things. I had him all wrong, and that complicates my hours with him in a way that makes me shrink into myself. I suppress the uneasy feeling by kneeling down and unzipping his pants. One night, I get home from work in the late evening. Carlina is down on the corner in a bathing suit and shorts, her waist like the curve of a guitar. She’s fanning herself with a newspaper and talking to Julio, a short guy who watches over the corner. He’s got a big belly, an incongruous handlebar mustache. He’s always smiling but I don’t buy it at all. Now there’s music playing softly from someone’s open window. Julio and Carlina wave at me as I stand in the doorway shuffling through the mail. There’s an envelope that doesn’t belong here. It’s to “Hombre Cinco,” and it isn’t my address. I look closer. It’s dirty, the stamp is years out of date, the canceling marks are illegible now, there’s no way to know when it was mailed. It looks as though it were rescued from the dungeon of a dead letter office. I should give it back to the postman. But I don’t. The address on the envelope isn’t far away. A few blocks, down by the canal. Just off the industrial street where the whores walk at night. I have to wait until morning. “Just a walk,” I tell him. I don’t like to linger with Julio. He starts asking questions. Who is my boyfriend and do I need any help around the house. I hurry down the street that fronts the canal. “Okay,” I say, backing away from the sour stink of him. There’s no one else around. Even Julio is too far away to help me. The man keeps walking, muttering to himself. He lurches away toward the empty park. When he’s out of sight, I turn back to the little street. One side is the solid wall of a warehouse, casement windows behind cast iron cages. The other side has three little townhouses with ugly siding, dirty white, hospital green, mud brown. I count the house numbers. Where a fourth would be, at the end of the street, is an empty lot. That’s the one I’m looking for. I go down and grab the big steel lock that binds the gates with a rusty chain, rattle it a little as though it might give. It holds fast. The lot is narrow and deep. The pavement is going to seed as grass and weeds push up through the cracked blacktop. Ivy snakes through the links of the cyclone fence and into the razor wire that crowns it. There’s a great sprawling Paulownia tree shading the back, and smaller ones pushing up all around the edges, growing out of the paltry, toxic dirt. Those trees grow fast, but still, the lot must have been vacant for decades. Maybe that’s all there is to it. I keep the letter in my pocket and head for the post office. My fingers graze its surface, feeling the grit collected in its limbo years. The line is long and slow. There’s a man up near the front of the impatient line, rocking a sleeping baby back and forth in a cheap stroller. He’s got the blackest hair and his skin is rosy brown. Finally it’s his turn, and there’s something a little frightened in the way he approaches the window. He’s holding out a tissuey paper, a carbon of some kind of official form. His words are soft and incomplete as he says to the clerk, “I need a photocopy. Can I do here?” She shakes her head. “No?” he asks, still a little hopeful. “I can not do that here?” The clerk waves him away. I would swear he is about to cry. The moment is frozen. I’m still six or seven people from the clerk’s window. I touch the letter in my pocket. I step out of the line. I’m keeping a secret I meant to turn loose. I hurry toward the door, just in time to hold it open for the man and his stroller. Up close I see it’s not tears he’s holding back. It’s rage. The letter stays in my bag all day at work. At night, in my kitchen, I stare at the stove. It would be so simple. But a little steam and suddenly you’re a felon. I’m not sure yet. I slide the envelope between two fingers and feel the edges of something less pliable than the worn paper. It’s a rectangle. Thicker than a folded letter. A photograph. My phone rings, and I pin the envelope onto the fridge with a tiny magnet, adding it to the haphazard collage of scraps and postcards. It works the wrong way, I always forget. Display a thing, and it becomes invisible. You can take a look at the cover here. The cover was designed by my good friend Ian Crowther. Here’s a video of him making it (there was fire involved). The book is coming out in June 2011, published by Red Lemonade. I’m really excited about the press because they’re doing very innovative stuff to connect readers and writers in a web-based community. My favorite feature is that you’ll be able to comment on manuscripts and have conversations with other readers and authors–right in the margins! I’m looking forward to seeing you all there when the site launches. My first novel is coming out in June 2011! 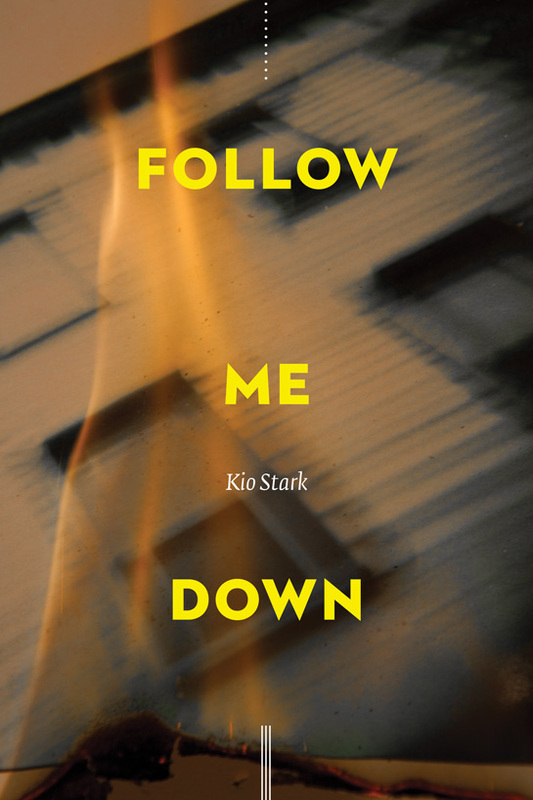 I’m so excited to announce that my first novel, called Follow Me Down, will be published in June 2011 by Red Lemonade. Follow Me Down is a work of fiction, but it’s set in the real world you’ve been reading about here in Municipal Archive. So, you’ll recognize some scenes and characters, now given larger lives. My writing–in general and this novel specifically–has been really enriched and energized by the enthusiasm you’ve shown and the conversations I’ve had with you all on this blog. Thank you so much!